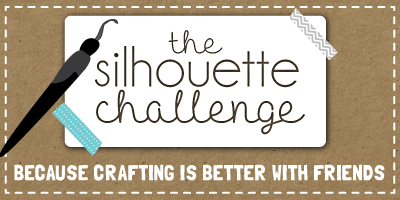 I am beyond excited to bring you the very first Silhouette Challenge Facebook Group ROUND-UP! This group is full of amazing crafters ranging from just-got-my-machine-out-of-the-box Silhouette users to I-could-literally-build-a-house-using-my-Silhouette experts! 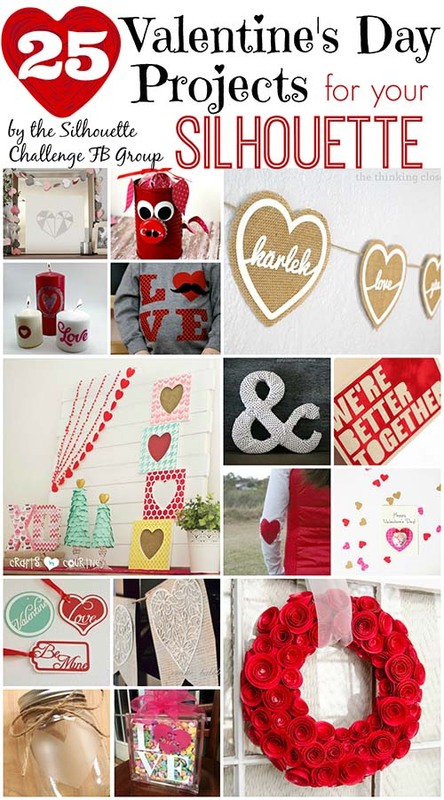 A bunch of these lovely ladies submitted Valentine’s projects to be featured in this Round-Up. So, if you have a Silhouette (or are dreaming of one!) 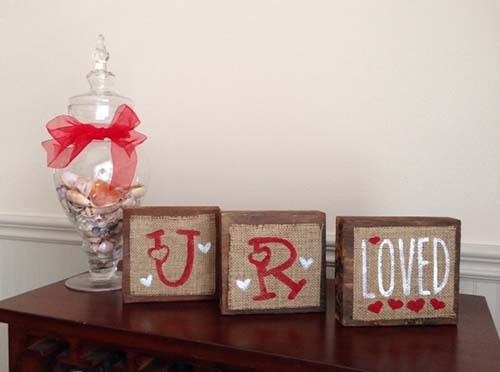 this round-up of Valentine’s Day projects is sure to inspire! Please be sure to visit these awesome blogs and pin from the original source! 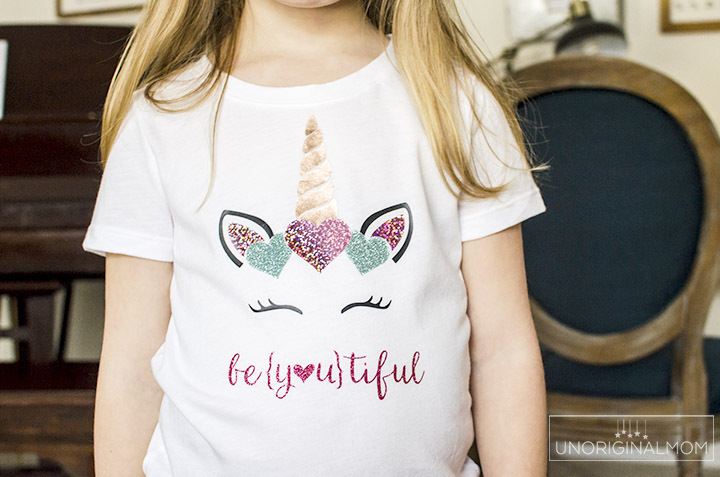 Before we get started, here’s one Unicorn Valentine’s Shirt I whipped up with my Silhouette and some truly AMAZING shimmer and shine heat transfer vinyl! Hop over here for the free cut file and sources for the vinyl. 1. 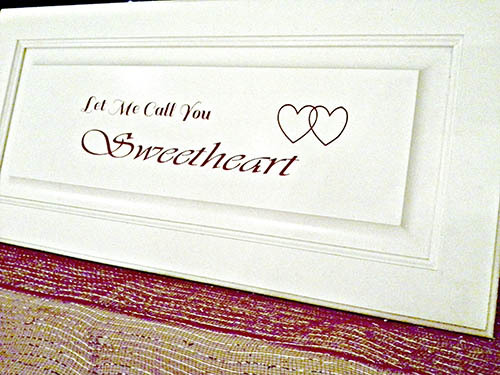 Stenciled Valentine Heart Frames from Crafts by Courtney. Courtney found these plain wooden frames for $1 each and gave them a major makeover! Visit her tutorial to see how she made vinyl stencils and painted over them using acrylic paint and finishing wax! 2. 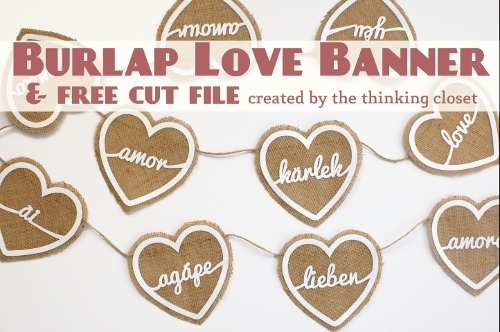 Burlap Love Banner (with free cut file) from The Thinking Closet. Lauren translated the word “love” into 10 different languages to create these neat heart shapes, cut them out of cardstock with her Cameo, then adhered them to burlap hearts. She was even sweet enough to include the cut file for you to make your own! 3. 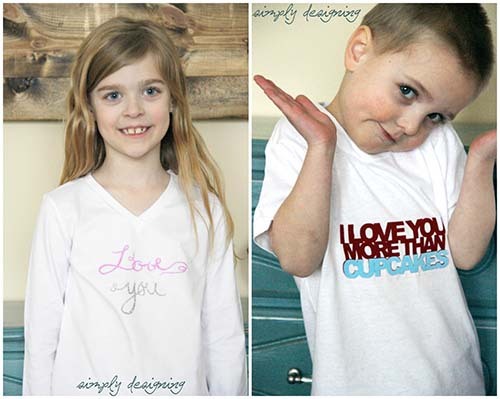 Valentine’s Day Shirts from Simply Designing. 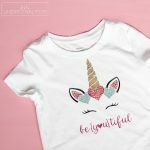 Using flocked and smooth heat transfer vinyl, Ashley created these adorable shirts for her even cuter kiddos! 5. 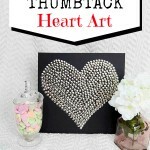 DIY Sweetheart Glass Block Tutorial (with free cut file) from My Paper Craze. 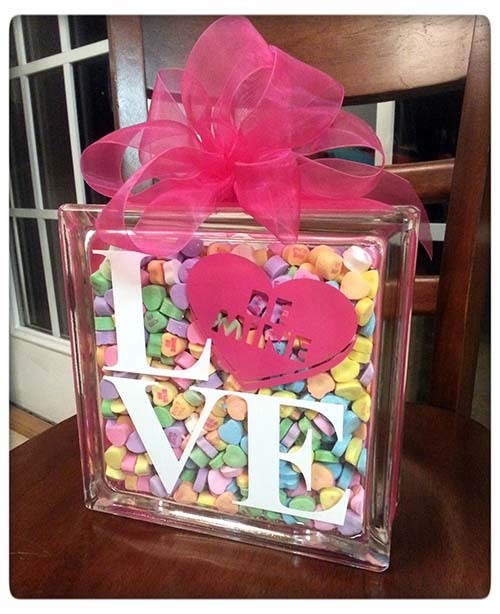 Becky and Glenna over at My Paper Craze used filled a plain glass block with conversation hearts and added the vinyl design – such a *sweet* way to decorate for Valentine’s Day – or a great gift! 6. 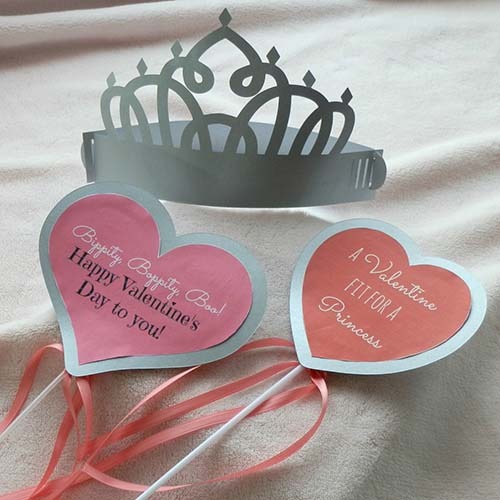 Cute and Easy Valentine’s Day Buntings (with free cut file) from TitCrafty by Camila. 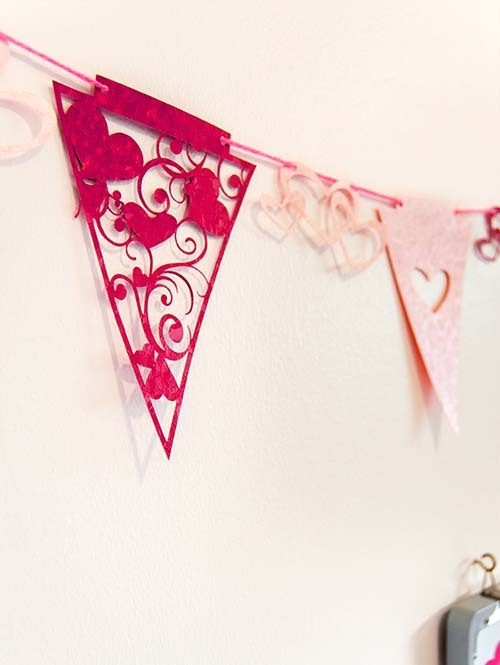 Using the free cut file and some pretty valentine’s paper, you too can make this beautiful bunting in no time at all! I just love the delicate design. 8. Simple Chocolate Heart Valentine from One Dog Woof. ChiWei created school Valentines using her Silhouette by sketching and cutting. I love how pretty and simple they are. And who doesn’t love chocolate with their valentines? 9. 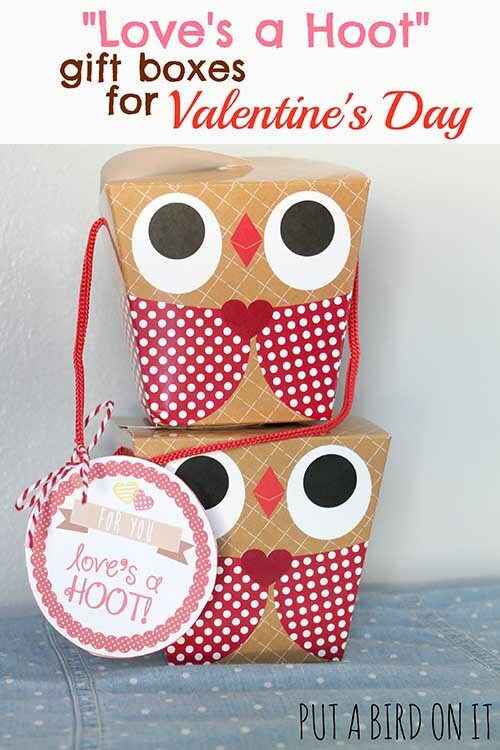 “Love’s a Hoot!” Free Printable Gift Tag from Put a Bird On It. Daniela found these insanely cute gift boxes at Target and created gift tags to go with it! 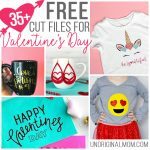 While she used her Silhouette to design and cut the gift tags, she included a free printable PDF so you don’t have to have a Silhouette to use it! 10. Lollipop Princess Wands for Valentine’s Day by From Wine to Whine. If you’ve got a little girl, you must head over to see Deanna’s fun lollipop princess wands. She’s included instructions for how to make them with OR without a Silhouette. 11. 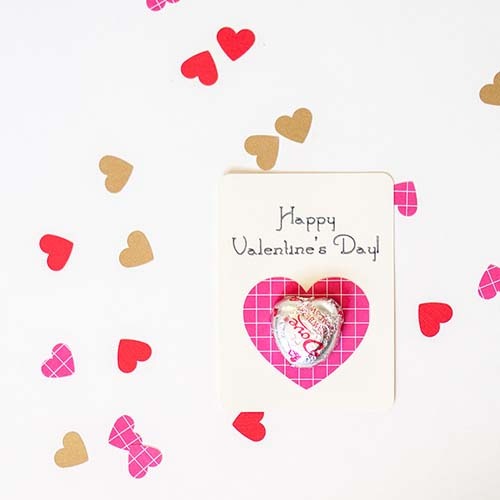 Valentine’s Day Card from Designed Decor. 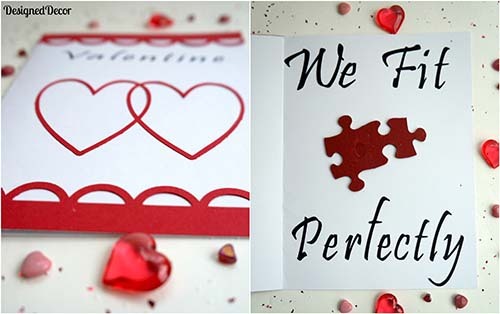 I just love the idea of puzzle pieces in a Valentine! DeDe found some random old puzzle pieces and painted them red to put inside her card (made with her Silhouette, of course)…and what a lovely card it is! 12. 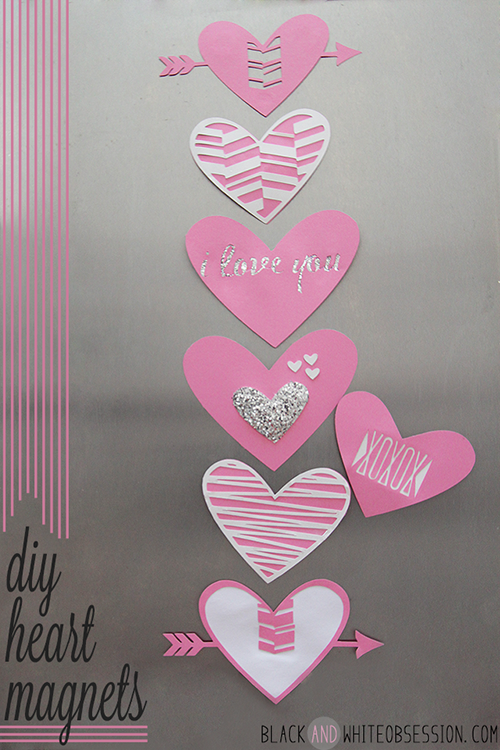 Valentine’s Day Magnets (with free cut file) from Black and White Obsession. In addition to sharing the cut files with you, Trisha shares a great tutorial on making these magnets…as well as her thoughts on where to get the best kind of cardboard for cutting with your Silhouette! 13. Glittery Valentine’s Day Candles from A Tossed Salad Life. I love using double-sided adhesive and glitter to glam things up! 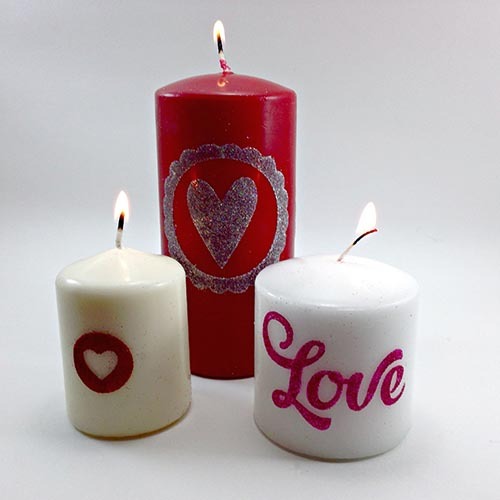 Emily used it to add some Valentine’s glitz to plain candles – presto Valentine’s decor! 14. 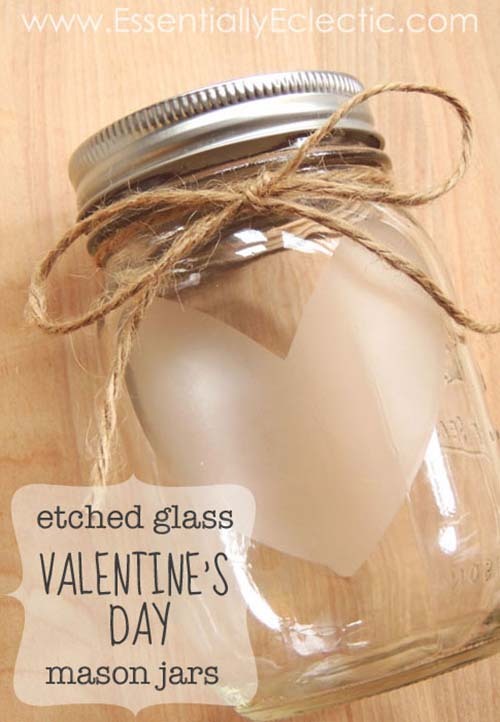 Etched Glass Valentine’s Day Gift Mason Jars (with free cut file) from Essentially Eclectic. I love how beautiful, simple, and versatile these mason jars are! Gabby shares a great tutorial on glass etching as well. 15. 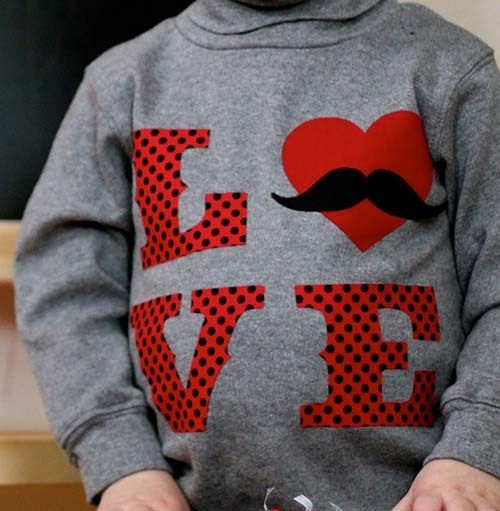 Valentine Shirt from McCall Manor. 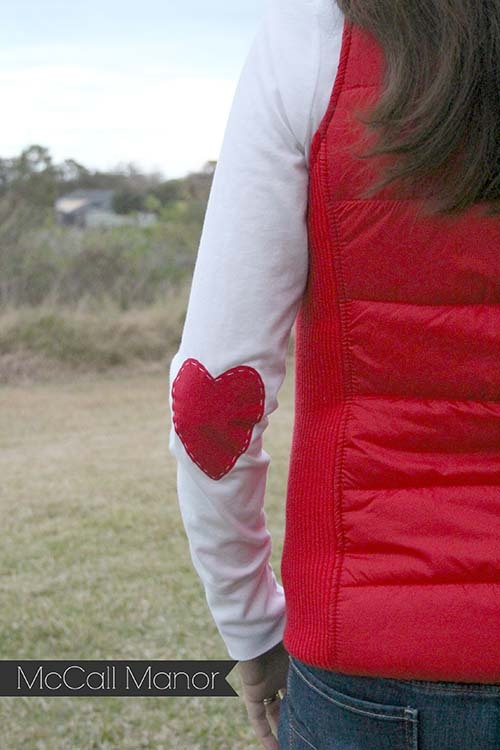 I have to admit, I am a little bit obsessed with these heart-shaped elbow patches! So. Darn. Cute. And it was even Holly’s first time cutting fabric with her Silhouette! 16. 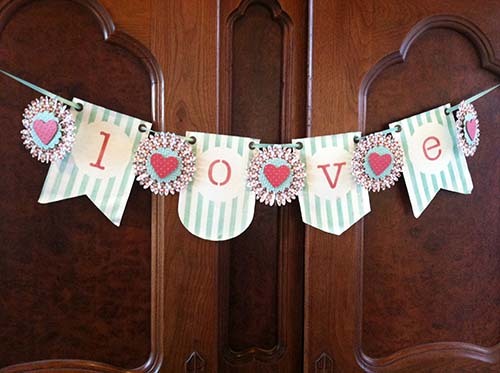 Valentine Banner from Create & Babble. 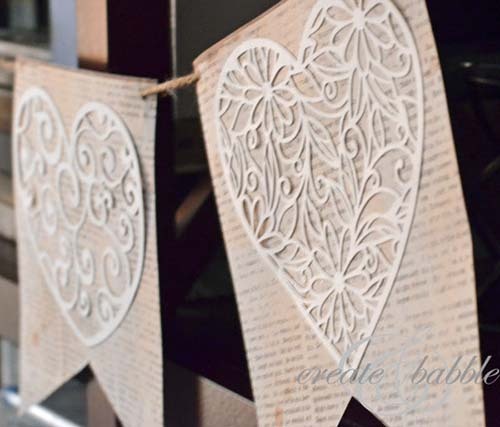 I am a sucker for a book page banner any time of year, but these delicate paper hearts that Jeanie added make it even more beautiful! 18. LOVE Pennant Banner from Peace, Love, and Joyce. Joyce made these fun rosettes using her Silhouette to add to her “love” banner – and I really like the color combination of the whole thing, beyond just pinks and reds! 20. 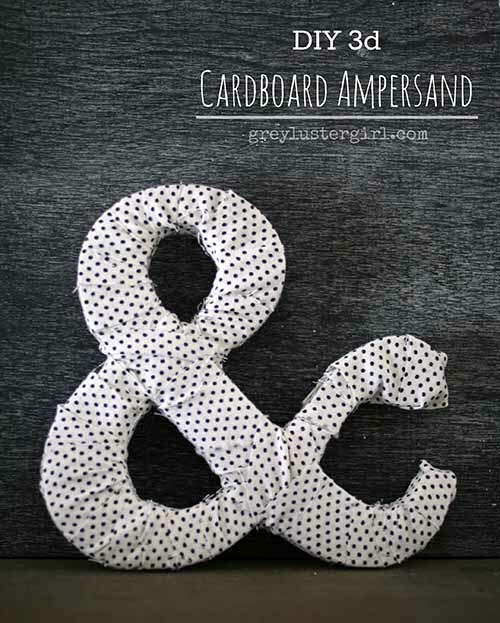 3D Cardboard Ampersand from Grey Luster Girl. If you’re looking for some great V-Day decor beyond the typical hearts and flourishes, this ampersand art is for you! Lisa used her Silhouette to cut two ampersands out of a cereal box, put styrofoam between, and wrapped with fabric to make 3D mantel art. The best part is – you can use it after Valentine’s Day has come and gone! 21. 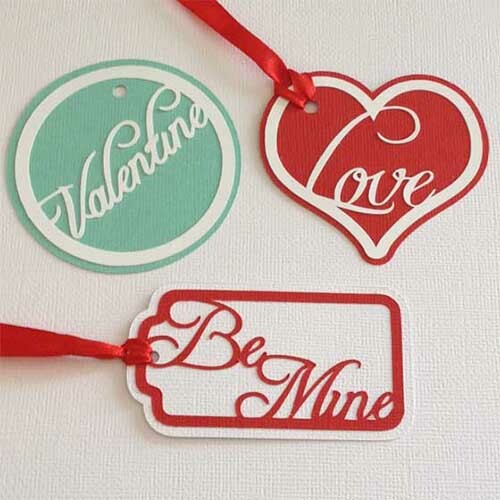 Valentine Gift Tags from GetSilvered. Gift tags aren’t just for Christmas! Pam made these beautiful tags with layered card stock, and has included a free cut file as well as a PDF for you to make your own! 22. 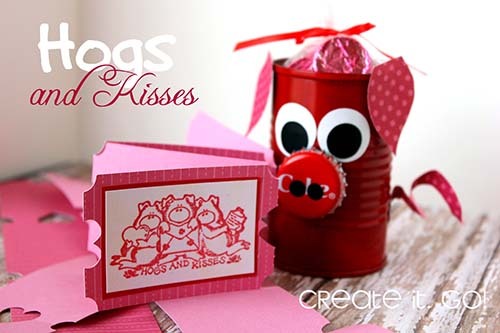 Hogs and Kisses in a Can with Show Your Love Tickets from Create it. Go! I love a clever pun (thanks to my dad for instilling that virtue in me from a young age), and let’s face it – Valentine cards are FULL of groan-worthy puns. This one, though, made me smile! Not to mention the giggle-inducing tin can hog! Robyn used her Silhouette to make “show your love” tickets to go along with her “hogs and kisses.” Too cute! 23. 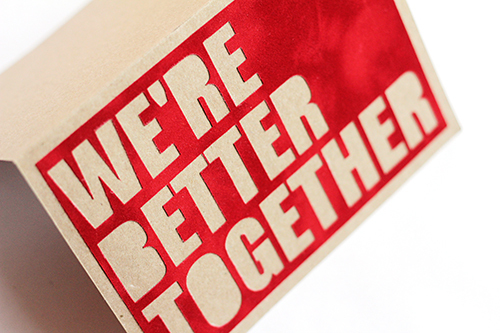 “We’re Better Together” Valentine’s Card from Tried & True. Nobody said you had to make a huge, frilly, elaborate card for Valentine’s Day. Vanessa made this simple card with her Silhouette out of flocked scrapbook paper and a blank kraft paper card. Lovely! 24. Valentine Love – Fry Carton Valentine from Little Blue’s Room. 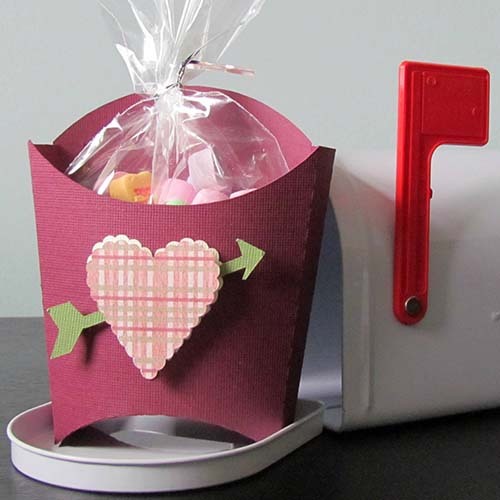 Not only can you make cards with your Silhouette, you can make 3D containers for candy! Angela shares this fry carton valentine she made and decorated. 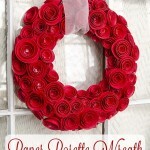 And a bonus project ;-) DIY Paper Rosette Wreath by me! I used my Silhouette to cut out over a hundred paper rosettes (yes, it took a while, but was totally worth it! 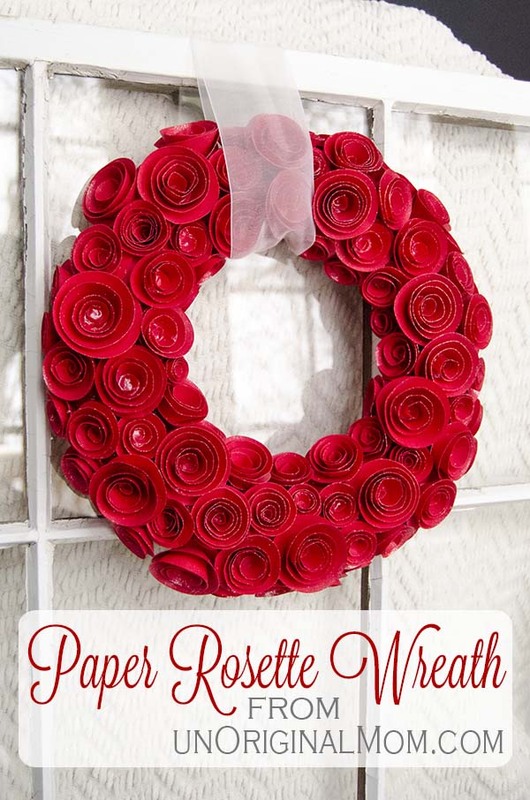 ), then attached them to a foam wreath and sprayed with glitter spray. Be sure to stop by for the free cut file! 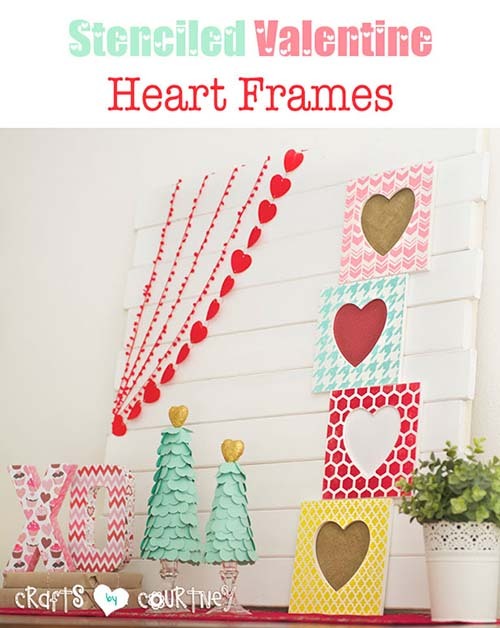 As much fun as it is to make beautiful Valentine’s Day projects like these, sometimes we just run out of time…there are only so many hours in a day, right? 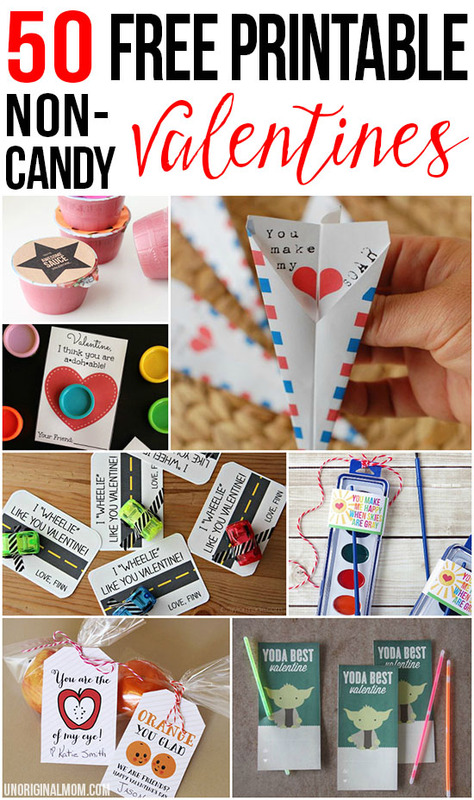 So if you’re stuck on what to do for school Valentines for your kiddos this year, you’ll find some great options in this list of 50 Free Printable Non-Candy Valentines! WOW what an amazing round up! I’m amazed really. 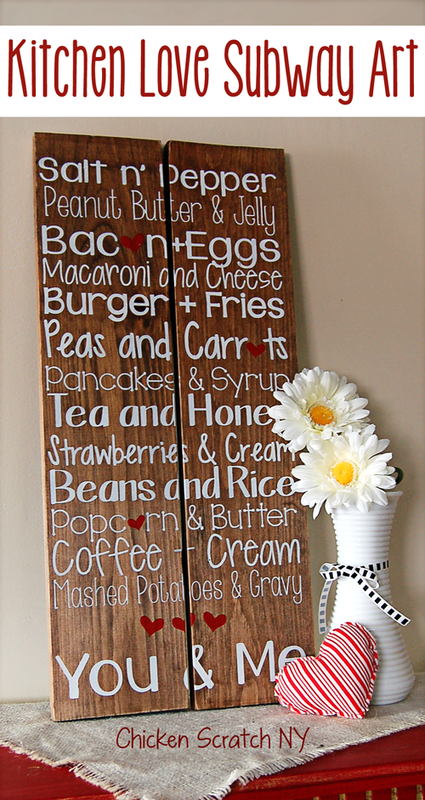 So many awesome ideas to make with our beloved silhouette! Can’t wait to check them all!!! Thanks so much for taking the time and the love to make this collection! Oh wow! What an amazing selection – so very inspiring! So pleased to be part of this round up. Thanks for organising it all! I think I just hit the jackpot on Valentine’s Day inspiration!! Great choices! Thanks for the feature, so glad we can get together and share the love (pun definitely intended!)! This looks great!!! Lots of fun projects to get us inspired! Thanks again so much for all your hard work in organizing this event. Wow, love them all! So inspiring. Great Round up! Thanks for your hard work, sharing too! Such an epically awesome round-up, Meredith! I know this took a lot of time and effort to compile – – thank you for your hard work. Now, off to promote the heck out of it! What a GREAT job everyone! I am hoping to make it in the February challenge. See you all there! yay I’m so excited to finally see the round-up. Your did an amazing job! 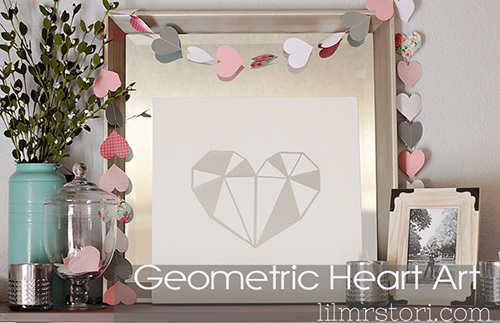 A big thank you for including my (#1) Stenciled Valentine heart frames in this list. I see so many other creative ideas here. I need to get crackin on some more Silhouette craft projects! I participated in the Valentine’s Challenge so I linked back to Unoriginal Mom too.